This weekend SY and I went to Hastings, a southern coastal, town 50-odd miles south of London, to meet my Dad and Ailz, do sightseeing, see art, go antiques shopping, eat fish and chips and check out the ruins of Hastings castle. Hastings was the landing site for the 1066 invasion of England by the Normans (French), which saw King Harold getting his eye done in by an arrow, as enshrined in the famous Bayeux Tapestry. 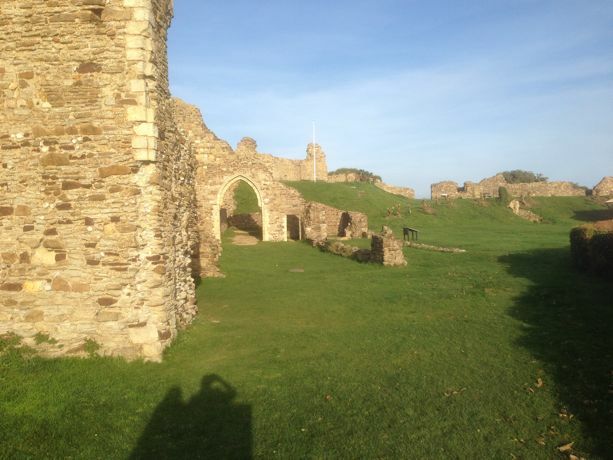 William the Conqueror became William 1, King of England, and three years later had Hastings castle built on a cliff overlooking both the bustling fishing town and the sea. 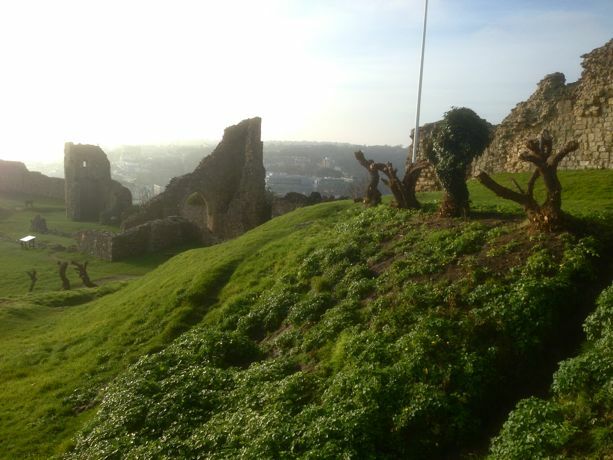 View from Hastings castle out over Hastings town and the sea. One of the main gates in. I climbed around on these walls, naturally. 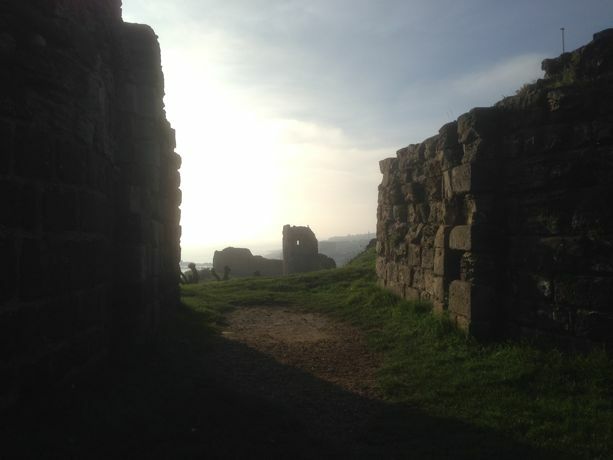 Panorama of the ruins. They really fell down. you can see both SY and me in this picture. A couple of doorways remain. 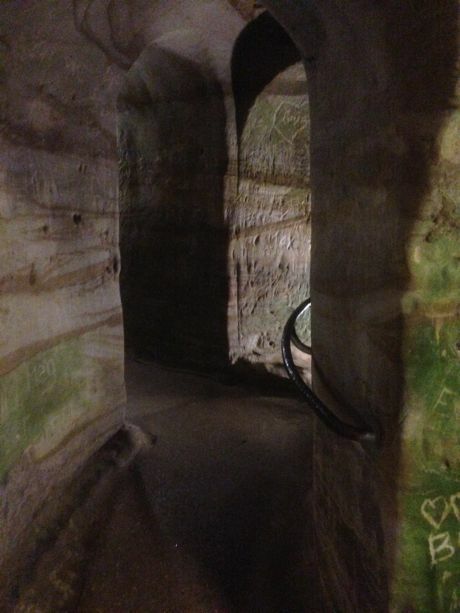 In the dungeons underneath. There were just a few tiny rooms here. Interestingly, half of the castle has since fallen off the receding coastline, making it look much smaller than it once was. It’s ruination seems to have happened in the 14th century, and was mostly a case of the local lords just letting the place go. Its structure crumbled under its own weight. Local fishermen probably came to mine stone from the massively thick walls to build their homes. Now there’s hardly anything left, though it still commands the highest ground around. 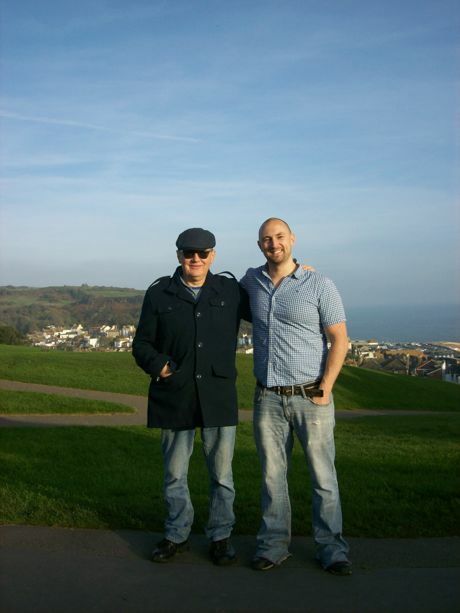 Me and my Dad in front of Hastings town, My Dad’s photo. We had fish and chips for lunch, with King Prawns for me as a starter, which were utterly succulent. I bought a set of ‘Curiosities of Literature’, 3 black leather-bound books with gold scrollwork, to match the 1841 Bible that is now in our dining room. SY bought various pots and plates. We also picked up bedside tables, which we need. We went to the Jerwood Gallery, which had a lot of the artist Lowry’s work. He was a manic depressive from Manchester (my neck of the woods) who seemingly never had a girlfriend all his life, after living with his mom until she died, then living alone for 40 years after. He does a lot of tableaux of scenes full of busy people done in a slightly child-like style, with all the people looking away and a keen sense of the painter’s isolation. He had a tongue-in-cheek sense of humor though too about his own loneliness- with his ‘Self-portrait as a pillar in the sea,’- which is simply a pillar in the sea. Funny stuff. I appreciate him. Lowry pictures including pillar in the sea. 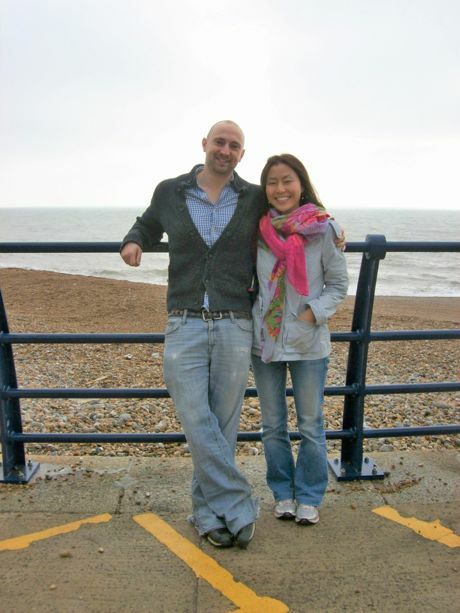 And a picture of me and SY by the beach, taken by my Dad.